I ATTENDED a meeting of the Nationaldemorkratische Partei Deutschlands (NPD) as a guest of the party leadership on February 7 and learned a number of interesting things which I want to share with you. My report follows. 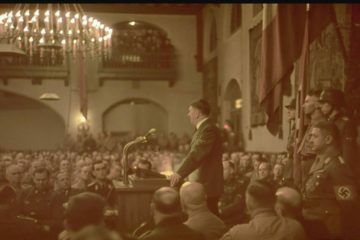 The meeting was held in the Nibelungenhalle in Passau, a Bavarian town of about 65,000 inhabitants on the Danube and Inn Rivers. As is usually the case with German meeting halls, there were no chairs for the audience. Instead, long rows of tables and benches filled the floor, with aisles between the benches for serving girls to bring refreshments to the audience throughout the meeting. The benches were capable of seating 5,500 people. At one end of the hall there was a stage with a lectern and microphones and a long table for scheduled speakers. There were also several tables just below the stage reserved for special guests. The meeting was scheduled to begin at noon, but I and the other speakers entered the room before 8:00 AM in order to avoid problems with the expected “anti-fascist” demonstrators. NPD monitors, wearing white armbands with the designation “Ordner” on them, quickly frisked everyone entering the hall. Female monitors frisked the women. No weapons or alcohol were permitted in the hall. 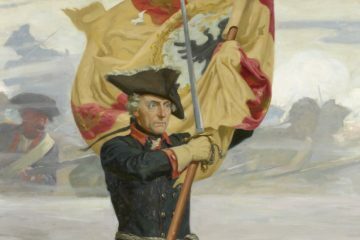 As I approached the hall in the morning, I saw a few scruffy-looking leftists marching around in the parking lot chanting their slogans, but at no time were the Reds a major menace in Passau. There was an extremely heavy police presence, with literally hundreds of green vans bearing the word “Polizei” in large letters patrolling the streets of the town and the vicinity of the meeting hall. About 20 policemen were quartered in the same small hotel I stayed in for two days, and I shared breakfast with them. By 10:00 AM the benches on the main floor were full, and then the second floor galleries which ran around three sides of the hall began filling. After the galleries filled, people began lining up along the walls on the main floor. When the meeting opened at noon, there were 6,600 people packed into the hall. Of these roughly a quarter were skinheads. I am offended by the sight of men or boys with shaved heads, tattoos, and gold earrings, but the German skinheads do seem to be better behaved then the American Variety. Like skinheads everywhere they love to fight, but there were no fights and no rowdiness in the hall. About a third of the audience was female. Ages of those attending ranged from about 17 to 85, with the average around 23 or 24. The behavior of the audience was good throughout the meeting, even though it lasted until 10:00 PM. I and six other principle speakers, including NPD chairman Udo Voigt and a guest speaker from South Africa’s Heritage National Party, marched the length of the hall and onto the stage in a ceremonial procession, to enormous applause. There were about 15 speakers altogether, and their talks were separated by party announcements, the showing of a new NPD promotional video, a performance by a German folk-dance group, and brief intermissions. The speakers were dynamic and forceful, generally made a good impression on me, and were well received by the audience judging from the applause. There was a total absence of hobbyism and posturing. The tone of the meeting was mature and serious throughout. The NPD leaders must be extremely careful to avoid references to a number of topics that are verboten by law in Germany––and this includes gestures, salutes, songs, insignia, and anything else which might remind the public of Germany’s years of glory before the present regime took over in 1945. This does not mean that either the NPD’s leaders or its rank-and-file members are not aware of these things, however. One of the last speakers was a 74-year-old woman, Marianne Hennig, who after a brief but spirited address gave a quick Roman Salute (or “Nazi Salute” as the controlled media would say) as she left the speaker’s podium. This was answered by a deafening roar of approval from the audience. If she were a man, the secret police agents in the audience probably would have marked her for arrest, but they must have thought that it wouldn’t look good if their only arrest was a 74-year-old woman. And there are other signs: Twice after conversations with NPD members and supporters, I was told “good-bye” with the expression “keep the flag high,” which mirrors the first words of the banned Horst Wessel Lied. The cover of a party periodical, Der Aktivist, carries the words “die Strasse frei” (“clear the street”), another reminder of the Horst Wessel Lied. The party’s periodical for high school students, Vorderste Front (Vanguard) carries poems by Heinrich Ananker and Kurt Eggers, both noted National Socialist poets who wrote during the good years. NPD leaders, of course, will claim that none of these things have any significance or suggest any connection with National Socialism. There were a few loose ends and a few organizational snafus, but overall the meeting was enormously impressive, inspirational, and successful and probably will lead to even bigger meetings during the coming year. Thirty years ago the NPD, which was founded in 1964, was much larger than it is today and held meetings attended by 30,000 people. It had elected representatives in nine of the 11 provincial parliaments. The party’s leader, Adolf von Thadden, was a major player on the national political stage, and a number of other very prominent Germans were members: for example, Hermann Oberth, the father of space travel. The parties of the System, the Christian Democratic Union and the Social Democratic Union, were very worried about the NPD’s rising star. Then in 1969 the government secretly financed a massive disinformation and smear campaign against Von Thadden and the NPD with the willing collaboration of the media. At the same time the Christian Democrats adopted some of the NPD’s programs, pulling away many of the party’s less radical supporters. The tactics caused a substantial drop in the NPD’s electoral success, and it lost all of its seats in the provincial parliaments. After that the NPD continued to decline in size until about two years ago, when it was down to fewer than 3,000 members. In 1996 the leadership of the NPD fell to Udo Voigt, a 44-year-old former Army captain. Voigt has been rebuilding the party vigorously, treading a careful line between the radicalism favored by the party’s younger members and the necessity of keeping the party Politically Correct in all its external manifestations––and therefore legal. One weakness of the NPD is its democratic structure: a weakness required by law in Germany. This means that the party’s leader must concern himself not only with building external support for the party, but also with maintaining his own support inside the party by countering the formation of hostile factions and the internal politicking of other would-be leaders. On the whole, however, the NPD’s governing board seems to consist of solid, responsible, capable, and very careful people. An American, accustomed to being able to speak freely, might think them too careful. Actually, they probably are doing and saying about as much as they can without getting the NPD banned and themselves locked up. If one speaks to them in private, one gets the impression that at least some of them have strongly held personal convictions which go far beyond what they say in public and are close to those of the Alliance leadership. At the same time, however, there are those board members who have quite different views. In any case, the NPD is making good progress now in recruiting both rank-and-file members and the talented people needed to provide leadership and give the party new capabilities. The February 7 meeting was the largest it has held since 1970––and the largest nationalist meeting of any kind in Germany in the last decade. The government has inadvertently helped the growth of the NPD by banning nearly all its competitors, permitting the NPD to pick up many of the former members of the banned groups. The NPD leaders are a bit naïve about racial politics outside Germany, the consequence of their focus on domestic matters. Despite this lack of knowledge, however, there seems to be a recognition that the time has come when mutually beneficial collaboration with nationalist groups outside Germany/Austria is feasible. Germany is cursed with the same sort of “anti-fascist” rabble we have in America: Jews, Communists, Turks and other non-White immigrants, homosexuals, feminists, guilt-stricken Judeo-Christians, and the rest. In addition, there is a substantial “punk” element among young people in the cities––working-class youth under the influence of MTV––and anti-fascist are able to recruit a number of these whenever they can promise them a free bus ride and the prospects of a good brawl. The organizers of every nationalist meeting in Germany must plan on dealing with this anti-fascist element. Only about a thousand anti-fascists showed up in Passau, and they posed a relatively small problem, even though the police always are more tolerant with them than with nationalists. The Reds were greatly outnumbered in Passau, and they knew it. 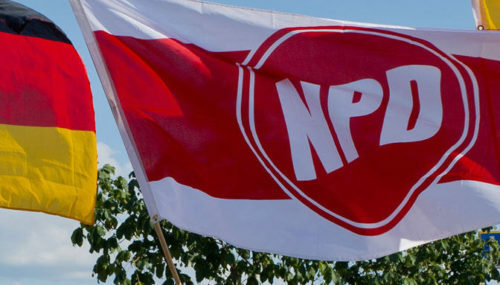 Their principle activity in connection with this meeting was an organized effort to prevent buses carrying NPD members and supporters from reaching Passau. They stationed gangs of thugs at a number of refueling stops on routes to Passau and attempted to sabotage the buses which stopped there. By this method, they were successful in keeping about 1,200 people from reaching the meeting, I was told. Similar gangs in Passau tried to intercept a few NPD buses, but proved to be only a minor nuisance. During the meeting the gangs found an empty bus parked in an area not under police surveillance, and they vented their frustration by slashing the tires and smashing all the windows, only to discover they had mistaken it for one of their own buses. Infinitely more of a problem than the Red rabble is the government, with its police powers. At the end of the Second World War, German patriots who were not murdered by the occupation forces were stripped of their civil rights: they could not publish newspapers or magazines, they could not teach, and they could not hold public office. Only traitors were allowed to have a part in public life. Anyone who wanted to hold office had to be investigated and approved by the occupation authorities. The present government is a direct descendant of the one installed by the occupation forces in 1945. The system politicians understand that when nationalists achieve power in Germany once again, the first order of business will be to round up every Christian Democrat and Social Democrat politician and put him up against a wall. The big business men (especially those involved in international trade who are very sensitive to Jewish propaganda against Germany abroad), the mainstream Christian churches (which receive a subsidy from the government), and, of course, the Jews (who are now flocking back into Germany in increasing numbers) are all allied with the treason parties. The postwar German government has built up a body of laws intended to prevent the resurgence of patriotism in Germany. Generally, these laws explicitly prohibit any utterance favorable to National Socialism, hostile to Jews, or skeptical of any aspect of “Holocaust” mythology. Beyond these explicit laws, however, the government strongly discourages any expression or activity which it considers hostile to its interests, and this includes almost every sort of patriotic activity, including NPD meetings. The government is obliged to walk carefully. It wants to maintain the public pretense that Germany is a free country, in which citizens have much of the same rights as citizens in the United States. At the same time, however, it is determined to do everything it can to harass and repress its enemies, and most of this harassment and repression is extra-legal: that is, it is done without any statutory basis. I encountered two stark examples of this during my recent trip to Germany. I planned my itinerary with a flight to Prague, in the Czech Republic, rather than into Munich. Prague is not much farther from Passau than Munich is, and I thought that I would be less likely to be intercepted by the secret police on the lookout for “undesirables” flying in for an NPD meeting if I came into Prague instead of Munich and drove across the border into Germany. Very much on my mind were the cases of Hans Schmidt and Gerhard Luack, both U.S. citizens who were arrested in Germany by the secret police and imprisoned because they had written things in the United States which the German government found offensive. In neither case did the U.S. government make an objection to their arrest or attempt to gain their freedom. I didn’t expect to be arrested, but I thought it prudent to minimize my contact with the authorities. I was picked up at the airport in Prague by a German Alliance member and a member of the NPD board, and we drove back toward Passau in the automobile of the latter. At the border, the cars ahead of us were waved through after a cursory glance at passports by the police. We, however, were ordered to pull over and were then subjected to an annoying search and interrogation lasting two hours. Apparently the police had the automobile license number of the NPD board member in their computer. Although the border police went through the motions of searching the car, if we had been smugglers we could have had 500 pounds of cocaine or heroin concealed in the car without their finding it. They focused their attention on us rather than the car. My luggage was picked through in minute detail. They examined every card and scrap of paper in my wallet and in my pockets, questioning me in detail about each of them. They disabled the ballpoint pens in my shirt pocket to see if any notes were inside. I had been careful to bring no printed material with me, and they found nothing of which they could make an issue. Then they forced me to remove all my clothes, including my underwear, and stand naked before them while they continued to question me. “You are going to Passau, ja?” they asked. We finally were permitted to leave, after the police had confiscated an audio cassette containing Politically Incorrect music from the NPD board member. The law does not prohibit a German from owning a single copy of a Politically Incorrect book or tape, but the law was not the principal concern for the border police. Their aim was to harass us, embarrass us, and let us know that the government doesn’t like us. My second encounter with the German government came at the NPD meeting. Shortly before I was scheduled to speak, a plainclothes Verfassungsschutz agent (the Verfassungsschutz, or political police, is a German equivalent of the KGB) approached the NPD chairman and told him that if I rose to speak I would be arrested and the meeting would be forcibly closed. I had given the text of my speech to a lawyer at the meeting specializing in such matters early that morning, and he had gone over it very carefully looking for potential legal problems. The lawyer had informed me that my speech was all right, and that it should cause no problems with the police. In any case, the Verfassungsschutz had no idea what I intended to say when they banned my speech. Their action was simply another instance of extra-legal harassment. The police would have had a hard time trying to close down that meeting, but NPD leaders chose to avoid any trouble which might give the government an excuse for taking action against the NPD later. I was extremely disappointed in not being able to speak, but I reluctantly agreed with the course chosen by the NPD. The banning of my speech was not the only official harassment in connection with the meeting. The Nibelungenhalle where the meeting was held is owned by the town of Passau. The Christian Democratic mayor of Passau informed the NPD shortly before the meeting that the party’s contract to rent the hall would not be honored. The NPD’s lawyers were obliged to run to court in order to hold the town to the contract. They were successful only at the last moment. The mayor then had a number of large banners prepared with the message “Right-wing extremists are not welcome in Passau.” These banners were hung in strategic places around the town by municipal workers. One was hung from a crane directly in front of the meeting hall. In the two days following the meeting I spent time in Regensburg, Augsburg, and Munich, trying to gain as many impressions of the situation in Germany as I could. Regensburg is a city with a number of medieval buildings which the Americans did not end up destroying during the war, and I always have been interested in medieval architecture. It was Sunday, and many Germans also were taking in the sights in Regensburg. During my tour of the city, I did not see a single non-White face, and thought that it was going to be a perfect day––until we were ready to leave, when I spotted a Chinese couple, but I was assured they were only tourists. My hosts also assured me that the real situation in Germany’s larger cities has become intolerably bad, with Turks and other non-European immigrants constituting a major presence. I believe that the Germans’ perception of the racial problem in Germany is a bit different from that of Americans, who really understand what a racial problem is, because even in Munich I saw only a few non-German faces: certainly less than one percent. My hosts explained that the Turks must have heard I was coming and stayed out of sight. While in Munich I visited the Odeonsplatz and the Königsplatz, which is especially rich in historical associations. Just outside the Odeonsplatz, where the Feldhernhalle is located, I walked down the center of the Residenztrasse, tracking the steps followed by Adolf Hitler and his comrades on November 9, 1923. I stopped where Hitler and his men had been fired on by the Bavarian provincial police and 14 of them killed. It was a deeply moving experience. During my discussions with my hosts I gained some insight into the knowledge and attitudes of the Germans about a number of subjects. Although German nationalists are aware of the possibilities of collaboration and welcome the prospect, there remain psychological barriers. Centuries-old ethnic animosities were exacerbated at the end of the Second World War by the horrible atrocities committed against the Germans. One of my hosts was a young nobleman whose family had lived in Carinthia. The allies decided to “ethnically cleanse” this area after the war. And his family not only lost their castle and their land, but everything else they owned and barely survived the harrowing trek out of the area. It is easier for many German nationalists to contemplate collaboration with nationalist in America than in the countries immediately around them. The German government has suppressed all information about anti-German atrocities committed by the Allies and their friends as well as about the exaggerations and lies in the “Holocaust” story. The government encourages the belief that only Germans committed atrocities. I have discovered that most Germans are not aware of what happened in East Prussia in 1945 and do not know about the deliberate sinking of the Wilhelm Gustloff in the Baltic Sea with the loss of more than 7,000 lives, the subject of one of my recent American Dissident Voices broadcasts. They also have not been informed of the Jews’ revisions of their “Holocaust” whoppers. For example. The Germans have not heard about the murder of 500 SS guards at Dachau after they had surrendered to the Americans, and they still believe the story that the Jews were gassed to death in the concentration camp there, as well as the stories about lampshades and soap made from the bodies of gassed Jews. the penalties for Germans who are trying to enlighten their countrymen. My personal feeling is that the Germans must shed a bit of their fear of authority and be willing to break a few laws––and a few heads––before they can be successful in taking back their country, but it would have been impolite of me to say this to my hosts. On the whole, I was encouraged by what I learned during my trip. Germany is ripe for the growth of an organization such as the NPD. The employment rate in Germany is 13% and rising. There is a great deal of cynicism about the System parties. Many young Germans who a decade ago might have been lured into supporting the System in return for the promise of material comfort are instead becoming radicalized and turning against the System. The NPD seems to have excellent leadership and is making great gains. The Alliance may be able to learn some things about organization and recruiting from the NPD, and the NPD may be able to learn some things about the use of the media––especially the electronic media––from the Alliance. I look forward to mutually beneficial collaboration between the NPD and the Alliance. In closing this report, I will contrast my own reaction to the NPD with a reaction I observed on the part of our enemies. During the meeting I was told that a reporter for the New York Times wanted to interview me, and I agreed to meet him in a back room behind the stage during the next intermission. He was Alan Cowell, a White man but one with an attitude and mentality typical of those spiritually sick and eternally dammed creatures who have sold their souls to the World Enemy.